Remarkably I was still harvesting carrots the last week of November- lucky us. 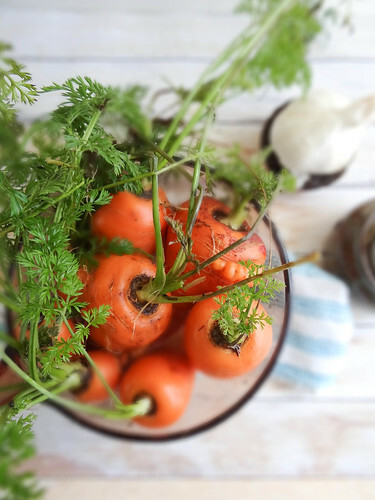 The longer carrots remain in the ground during colder months, the sweeter they become; a sweet reminder for me to plant a larger harvest come spring. I absolutely adore pureed soups, creamy and velvety without the cream. 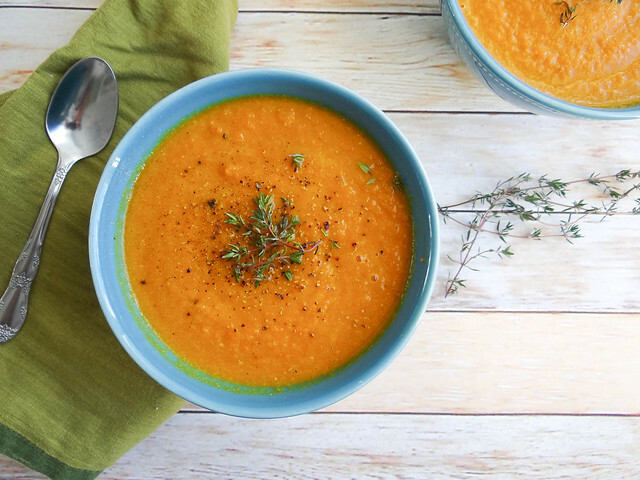 This soup is perfect for fending off the sniffles; turmeric, garlic and curry are all known to help ward off stubborn winter colds, helping to ramp up your immune system. Due to the mild winter we have been experiencing I still have plenty of thyme in the garden - the earthy thyme pairs extremely well with the sweet carrots & warm spices. 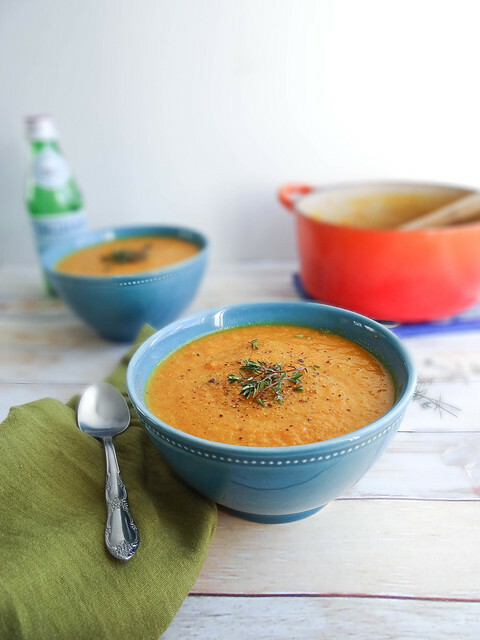 A quick soup to make during the week that really takes no time at all, perfect for those nights when you are just too exhausted to make an elaborate meal but still crave something warm and filling. During the month of December I double up on my healthy eating habits- with all the sweets and rich meals during the holiday's it's nice to have few healthy easy to make recipes that balance out those rich & decadent meals & treats. What are your healthy eating tips this time of year? Toss onions, carrots and garlic with the oil and evenly spread on a large rimmed sheet pan. Roast in the oven for 20-25 minutes or until tender and caramelized. Remove from the oven and add roasted veggies to a medium soup pot - add spices, salt (to taste), thyme & water. Bring soup to a boil and simmer for 5 minutes. Remove from heat and blend with an immersion blender or in batches in your blender with the top vented. Ladle into bowl and season with salt and pepper to taste and additional thyme if desired. gorgeous color of the soup! most of our plants died last week because of the 10 deg f weather for 3 days. all my beans, greens and most herbs. :( i am trying to revive some. This is making me want to go plant some carrots right now! Although it might be just a touch early. :) Simple & flavorful vegetable soups like this are the best. So perfect for winter! This is such a lovely recipe. I like how you roasted the veggies first! I love all carrot soups! Roasted a mix of veggies right now and the aroma is absolutely intoxicating! YUM! Cannot wait for dinner! P.S. I apologize for being a horrible blogger friend recently :( I'm hoping to have more time to devote to my online life soon though, because I miss you!!! Mmm, this soup sounds perfect for a day like today. We just finished digging ourselves out of the driveway, and all I want to do is curl up under a blanket with something warm! This sounds like a great soup, I'm going to have to try it out! I love carrot soup, but a roasted carrot soup must be better. Thanks for sharing! 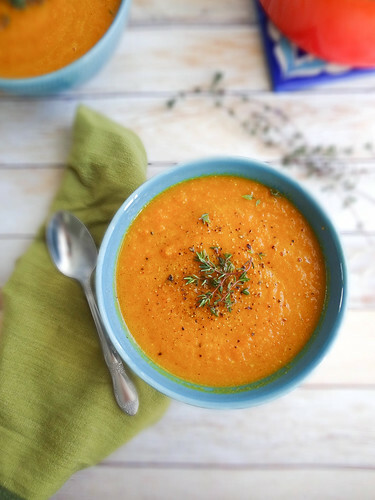 I love pureed soups too, and carrots with garlic and spices sounds perfect for this time of year with everyone getting the sniffles! Its nice to have a batch something healthy like this around for quick and easy meals too during the busy holidays. 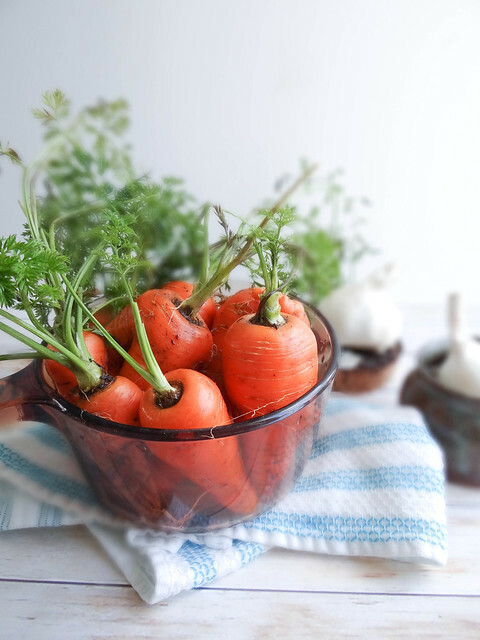 This garlicky roasted carrot soup recipe looks wickedly different and tasty! I'm vegan and am always on the lookout for such recipes. Simple recipes can be learned by anybody in no time. Ooh this soup looks like exactly what I need right now. Light and delicious. Soups & super leafy green salads are my go-to when I start to feel bloated from all the holiday food fun. I will definitely be making this one in the next couple days! Yum! This soup is absolutely lovely. The Quit 9 to 5 Academy course is considered as a big opportunity for people who’re dreaming to become a skilled internet marketer. With the majority of the world’s working population falling into either the Employee or Self-Employee sectors, there has been an increasing trend of people looking for alternative incomes and lifestyles.